Kanika Datta visits the Cu Chi military tunnels -- a testimony to a plucky little country's 30-year war of resistance against, first, French colonisers and, then, the US. 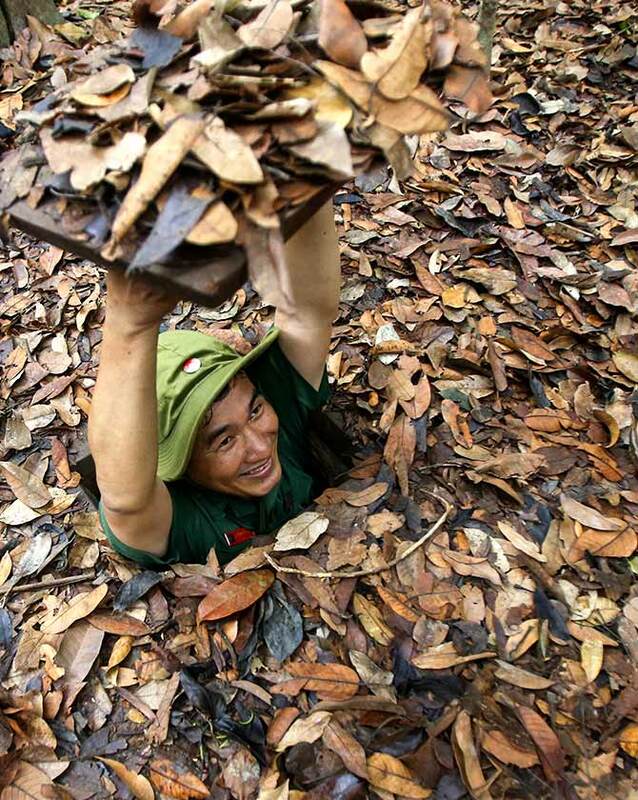 IMAGE: A Vietnamese tour guide demonstrates how to disappear into the Cu Chi tunnel network through a hole camouflaged on the jungle floor. Vietnam will mark the 42nd anniversary of the capture of Saigon by North Vietnamese forces -- and the defeat of the US forces -- on April 30. Photograph: Kham/Reuters. Crawling through the suffocating damp brown clay of a dimly-lit tunnel with just enough space for your torso is not the stuff of a standard vacation. But then, recreation must have been the last thing on the minds of the thousands of Vietnamese who dug the tunnels at Cu Chi. This extraordinary network of tunnels is testimony to a plucky little country's 30-year war of resistance against, first, French colonisers and, then, the United States. Cu Chi was the centre of the ingenious guerrilla resistance in the heart of enemy territory. At its height in the late 1960s, this improvised complex, built without any overall supervision or grand plan, covered thousands of kilometres and radiated out from Ho Chi Minh City (formerly Saigon), then the capital of a US puppet state in South Vietnam, to the Kampuchean border. It was, in effect, a vast underground military base -- the Vietnamese version of the Green Zone that the US military maintained in Iraq during another ill-judged invasion three decades later -- but did not fall under any formal army command. Here was a "people's war" in every sense of the term. IMAGE: A map of the Cu Chi tunnel network, which spreads out over 200 km and includes sections for living, dining, meeting and fighting. Photograph: Reuters. The tunnels, first built in the late '40s, "held living areas, storage depots, ordnance factories, hospitals, headquarters and almost every other facility that was necessary to the pursuit of the war by South Vietnam's Communists that could be accommodated below ground," wrote Tom Mangold and John Pennycate, in The Tunnels of Cu Chi (Pan Books, 1986). Mangold and Pennycate carried out the first investigation of this tunnel system for BBC TV in the late '70s, and it is a much-read, dog-eared copy of this riveting book that brings me to Cu Chi. Today, a fraction of the original network has been preserved as a tourist attraction in a village about an hour's drive from the centre of Ho Chi Minh City. This was the "Iron Triangle", an area of the most fearsome resistance -- "A dagger pointing at Saigon," an American general put it -- during the 1968 Tet Offensive that turned US public opinion decisively against the war. The Vietnamese are justifiably proud of the heritage of their victories over two global powers. 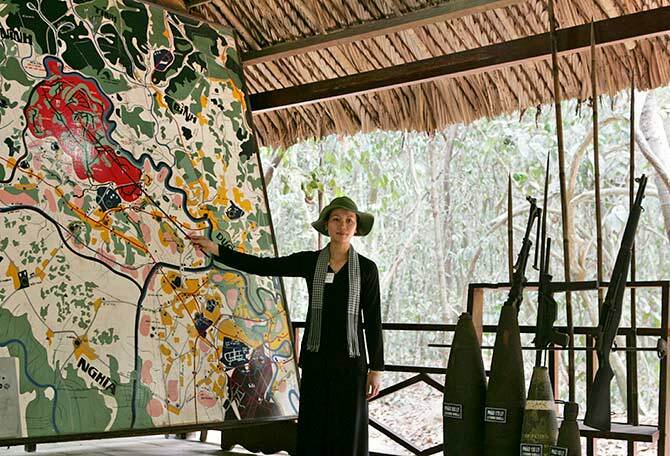 Cu Chi is the piece de resistance of the country's war commemoration. 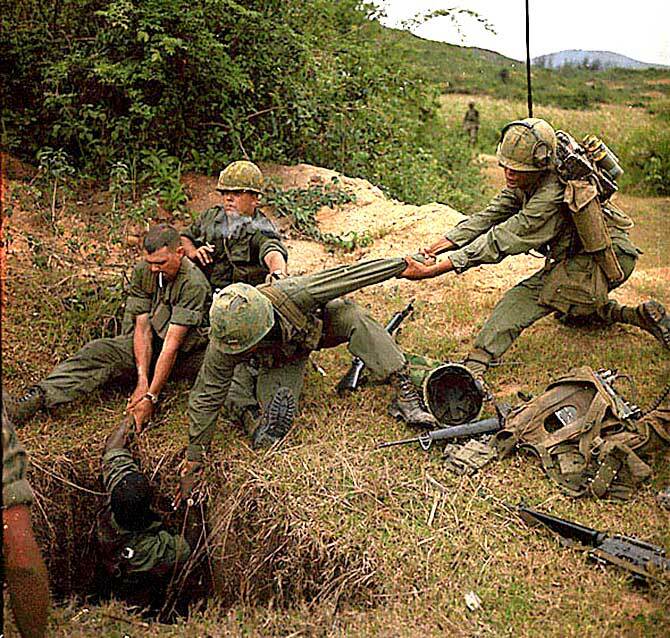 IMAGE: US soldiers lower a member of their reconnaissance platoon into a Viet Cong tunnel during a search and destroy mission in Vietnam, in April 1967. There were connectors and auxiliary tunnels for Vietnamese soldiers to hide when pursued by the famed "Tunnel Rats," slightly built GIs who volunteered to crawl into this underground labyrinth in search of enemy. Guides take turns to lecture tourist groups about the tunnels, complete with jerky black-and-white films of hordes of Vietnamese disappearing down impossibly tiny black holes. Outside, a guard obligingly demonstrates this disappearing act, and invites us to try. Some intrepid tourists accept and invariably emerge from the stifling inky blackness looking mildly distraught. The demo is a brief taste of the real thing. Further on are two tunnels, electrified and expanded for well-fed tourist physiques. Even with these "luxuries", the experience is, at best, disagreeable -- and that's if you are not mildly claustrophobic. It's a 10-minute crawl, not recommended for anyone with blood pressure. How about a longer 20-minute crawl? Out of the question for me, though some burly Russians gamely opt for it. It's hard not to be ashamed of your fear when you know that Vietnamese women and men endured this existence for years against a well-armed foe, without electricity or, since most of the tunnels went as deep as 15-20 feet, adequate ventilation. The World War I trenches on the Western Front seem like a Bermudan resort by comparison. Not surprisingly, the Vietnamese's most prized possessions were the flashlights they stole from American GIs, as were shards of shrapnel to fashion crockery, tools and medical implements. 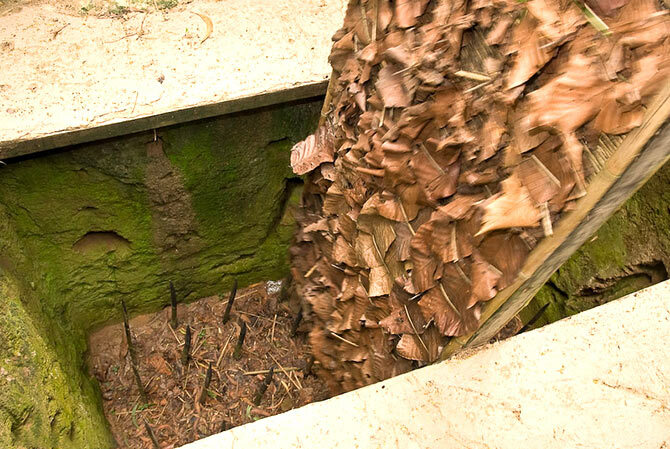 IMAGE: The "punji stake" trap guaranteed an agonising death for those who stepped on to a camouflaged revolving trapdoor studded with sharpened poisoned bamboo stakes on which victims are impaled. Photograph: Jos Dielis/Flickr. Now exposed to the open, you get to see, above ground, the ingeniously designed grid of underground hospitals, recreated here in gruesome detail, sleeping chambers and storage dumps and even a kitchen with chimney outlets some distance away to fool the enemy. There were connectors and auxiliary tunnels for soldiers to hide when pursued by the famed "Tunnel Rats," slightly built (and slightly mad) GIs who volunteered to crawl into this underground labyrinth in search of enemy. The tunnels were not the only obstacle the Tunnel Rats, whose story Mangold and Pennycate relate in detail, had to encounter in this "most bombed, shelled, gassed, defoliated and generally most devastated area in the history of warfare". The "punji stake" trap guaranteed an agonising death for those who stepped on to a camouflaged revolving trapdoor studded with sharpened poisoned bamboo stakes on which victims are impaled -- the demo version is tightly fenced to prevent accidents. Near a patch of scrub is a shooting range where you pay a nominal sum to fire an AK47 at a target -- usually (sadly) a mock-up of the Alsatians the Americans used as sniffer dogs. 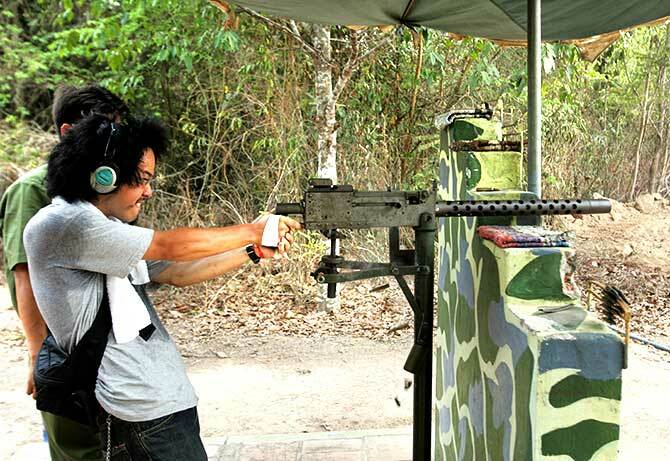 IMAGE: Adding to the war tourism experience is the opportunity to fire machine guns -- for a nominal sum. Photograph: Reuters. Back in Ho Chi Minh City, a bottle of Ba Ba Ba (333) beer is a welcome break from the unremitting grimness of Cu Chi's history. But do be careful how you pronounce Ba Ba Ba. Get the tone wrong and you could be asking for women of questionable virtue instead of a brand of alcohol.